The boat rocks suddenly as sea-spray flicks across our faces. Again, another salty smack, as skipper Alex Doroba cuts the engine. With the motor off, the boat swivels around slowly facing away from the notorious Knysna Heads, limestone cliffs standing sentinel at the entrance to the lagoon. Even skilled sailors have come undone by the vicious tidal currents here, over the years. It’s freezing, but my fellow passengers and I are smiling through the shivers. It must have something to do with the platter of wild oysters in front of us, and the bottles of crisp Chenin Blanc. For this is what you’re supposed to do when visiting Knysna… Slurp from the deep, gnarly shell in your left hand, sip from the wine glass in your right. Or vice versa. Repeat. If you’re on a boat, throw the empty shell casually into the lagoon. Such hedonistic behaviour is a prerequisite in this popular Garden Route town – because Knysna is South Africa’s oyster capital. Right? Wrong. Or at least, technically, not any more. It used to be – SA’s first commercial oyster company was founded here in 1948, due to a growing demand that supply of indigenous wild oysters could not meet. (Interestingly, history shows that local interest in oyster cultivation dates as far back as 1673, with limited success.) From 1973 onwards, the oyster boom really hit, and farms were set up, a great source of job creation for many families in what was then still a small forestry and fishing town. Ten years later, in 1983, the first Oyster Festival took place. Its main purpose was to attract tourists during the quiet winter period with a number of sporting events. Yet it effectively sealed Knysna’s reputation as oyster HQ, no doubt helped by the fact that every year, hundreds of thousands of oysters were consumed during the 10-day event. Fast-forward to the 21st century, however, and after initial success, the farms began to face numerous challenges, and there were whisperings about poor water quality and permit hurdles. Somewhat ironically, the Oyster Festival was enjoying a massive rise in popularity. And in 2010, for reasons that remain unclear, permits weren’t renewed and the farms were closed. Knysna’s famous oyster beds now lie defunct in the lagoon. Some of the old mesh oysters “poches”, the cages that housed them, lie aging beneath the water’s surface, barely visible to the eye. So, if not Knysna, where do the majority of our oysters come from? 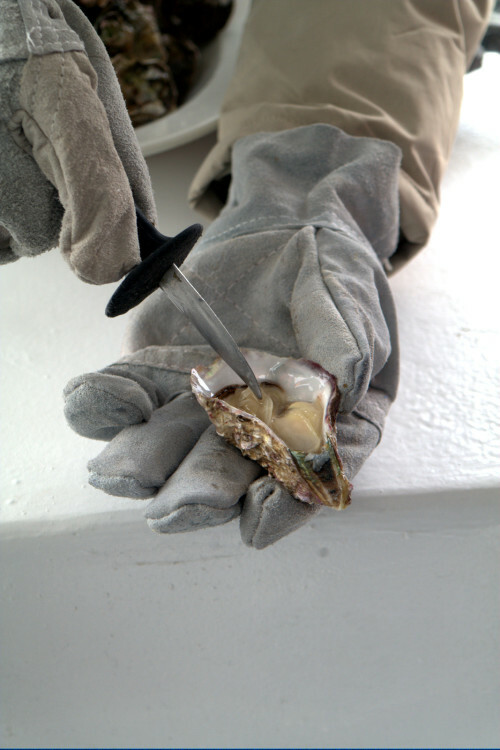 Still on the boat, we put the question to Alex, while trying our hand at shucking (a harder-than-it-looks process that needs a stubby sharp-bladed knife, thick gloves, some concentration and a lot of coaxing). Turns out they enjoy quite a journey. 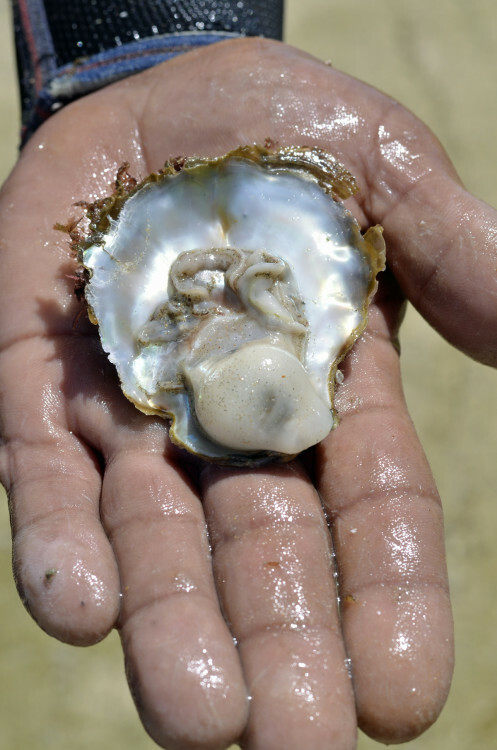 The seeds or ‘spat’ of the Japanese Pacific oyster, known as Crassostrea gigas to those in the business, a hardy species well adapted to local water conditions, are shipped from nurseries in Namibia or Chile. They are then grown in South Africa until maturation at a few locations, most notably Algoa Bay in Port Elizabeth and Saldanha Bay on the Cape West Coast. I decide to visit the latter, and find myself on another boat, this time gliding over calm peacock-blue water on a blistering factor-50 day. 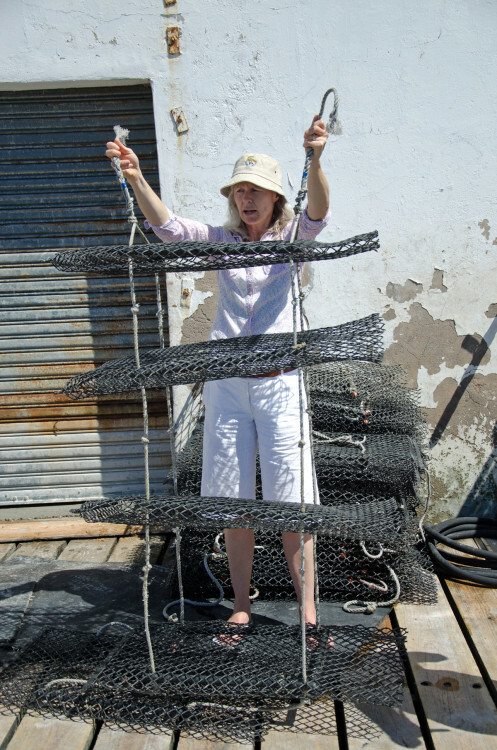 With me is Sue Jackson, a marine biologist who, together with her scientist husband, Antonio Tonin, runs Saldanha Bay Oyster Company, the country’s largest commercial oyster concern (they relocated from Knysna in 2005). 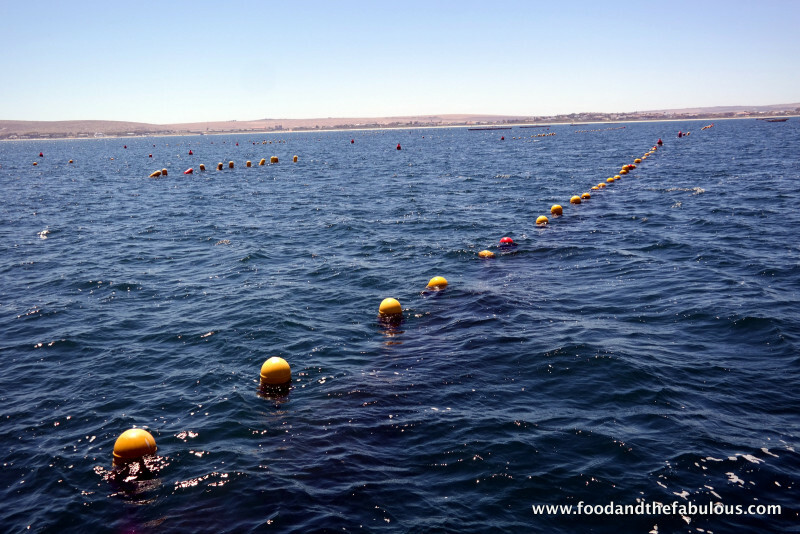 Because Saldanha Bay is sheltered, says Sue, and fed with the nutrient-rich saline waters of the Benguela upwelling system, there’s far more phytoplankton – the food on which oysters feed – than in Knysna. ‘Our oysters grow faster and plumper, and almost three times quicker than the same species in France,’ she says. And the Saldanha Bay ‘merroir’ – that’s shellfish farmer’s speak for ‘terroir’, imparts a unique and subtle sweetness to the bivalve’s flesh. Out on the bay multi-level baskets like enormous mesh cake tins lie suspended from a series of ropes. In them lie the oysters, graded by size, gobbling up nutrients. It takes a year for the spat to grow from under half a centimeter in width to full size, sometimes as large as the palm of one’s hand. There’s little harm from predators, but concern about pollution is constant. Every two months the cages are taken to the factory where the oysters are rigorously cleaned of ‘biofouling’ – a build up of various marine organisms. ‘We’re thorough about hygiene. Militant, in fact,’ Sue says of the group of neighbouring oyster farmers in the area, who unite on most matters. 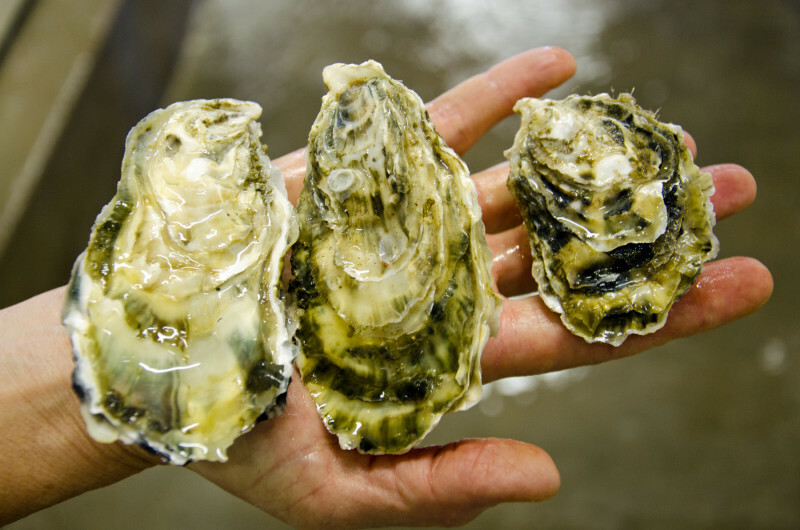 These oysters then spend the last two months of their growth cycle in the outer bay, imbibing the water’s sweetness, before being transferred to the factory for a final sort. Cold water eases them into a brief slumber while they are packaged and loaded onto refrigerated trucks for transport to suppliers nationwide, while a small percentage is exported. I can see that it’s a system that really works. But I can’t help remembering those wild oysters, with their lip-smacking taste of the sea, back on the boat in Knysna. Limited as they are, how do they wind up on the restaurant table? It’s a few months, and another trip back up the Garden Route, before I can find an oyster picker who’s willing to chat candidly to me about it. Harvey Dodgson is a seasoned licensed professional who walks with a limp (‘It’s my hip,’ he says apologetically). For the last 14 years, he and his partner Mingo Jacobs, a third generation picker, have been working for themselves. 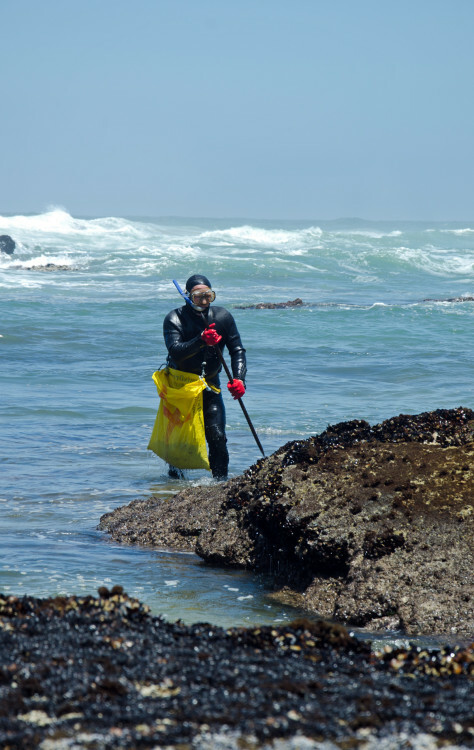 It’s a tough way to make a living – permits are expensive and involve on-going administration; it’s weather dependent and pickers can only work for two weeks a month during the spring tide. Rapacious restaurants want to buy at the cheapest rate, placing the pickers in a quandary; stock can’t be kept longer than a day or two without proper refrigeration before it spoils. The sought-after wild oysters they supply are limited in quantity and sold at exorbitant mark-ups. None of this benefits the picker. Luckily for Harvey and Mingo, they are the sole suppliers to Oysters R Us, a rustic oyster shack and educational hub in Wilderness, run by Natasha de Freitas. It’s become a phenomenal success on the Garden Route. Harvey and Mingo receive a fair price, and it’s a relief, he explains. ‘In winter, it’s pitch-black when we leave. You’ve got to be there two hours before the tide, while the rocks are more exposed,’ says Harvey. Spotting the oyster is the first challenge: ‘They look just like the rocks.’ Armed with crude ‘crowbars’ of at least a metre and dressed in wetsuits, snorkels and boots (fins aren’t allowed), the pickers comb the icy water for the molluscs. ‘My record is eight bags,’ Harvey smiles. A good day now yields two or three bags. The next day I meet Harvey and Mingo at the Wilderness beach. I lose count of the steps to negotiate before reaching the shore, and it dawns on me that Harvey has to walk down and return back up with bags weighing almost 50kg each. Word on the Street: According to Greg Vogt, CEO of Knysna Tourism, this is set to change within the next year. “The water in the estuary is the ideal environment, and now it’s just a matter of red-tape. 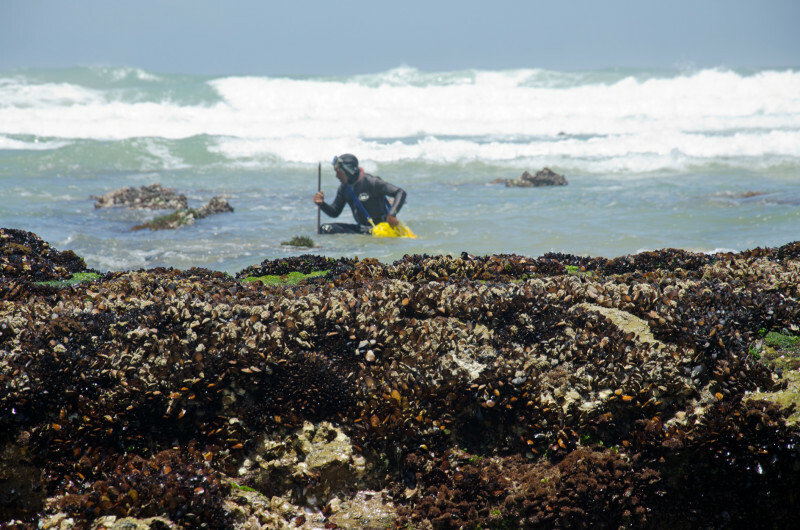 Oyster farming in Knysna makes perfect sense,” he says. No concrete information was forthcoming about when to expect the new farms (at the time of print). 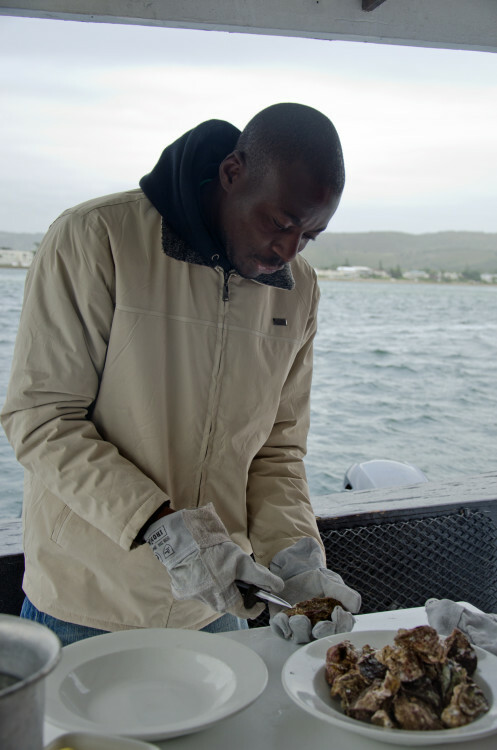 Filter Feeders: Mark Dixon, marine biologist and tour guide, explains that bringing the oysters back will ensure continued purification of the Knysna Lagoon. Like mussels, oysters are filter feeders that have been used successfully to transform rivers and bays in several countries. When water conditions improve, he says, not only do other species return, but people can once again enjoy activities like paddling without fear of health risks. One of the most beneficial aspects of Knysna oyster farming will be the employment opportunities it’s set to create. Oysters are most often associated with scorching summer days, but they taste sweeter in autumn and winter. In summer, when they’re spawning, they can be milky with a slightly bitter aftertaste.